American Cruise Line offers one-way small ship cruises from Jacksonville to Charleston, South Carolina. 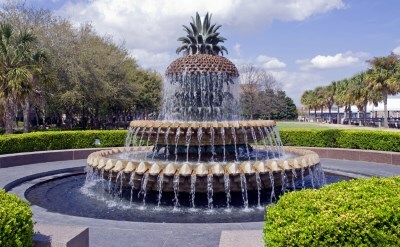 The 7-night trips are on the calm Intracoastal Waterway and stop at Amelia Island (Florida), St Simons Island/Jekyll Island (Georgia), Sapelo Island (Georgia), Savannah (Georgia), Hilton Head (South Carolina), and Beaufort (South Carolina) before arriving in Charleston. St Simons is the largest of the Golden Isles, the barrier islands along the coast of Georgia. Jekyll Island has the Georgia Sea Turtle Center and the lavish "Millionaire's Village" historic district. 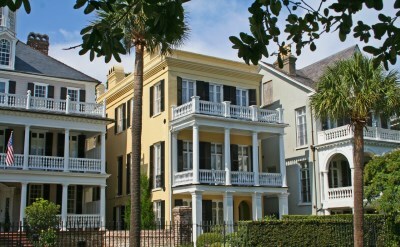 Savannah is famous for its beautiful squares and historic style. It's extremely walkable, or you can take a trolley tour. The waterfront is loaded with fun restaurants and shops. Hilton Head is a well-known oceanfront resort. Hit the beach, play golf (33 courses), sample the local food (250 restaurants), rent a bike (60 miles of trails), take an Antebellum home tour, or take a boat tour of the Sea Pines Forest Preserve. Beaufort is a town that attracts many visitors. Explore the historic district on foot or in a horse-drawn carriage. 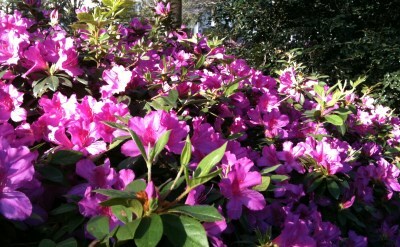 Tour the surrounding Low Country region. Your cruise ends in Charleston, which was rated #1 city in the USA by Travel + Leisure and Conde Nast Traveler magazine readers. Attractions include a huge historic district, excellent shopping, Fort Sumter, Magnolia Plantation and Middleton Place plantation. 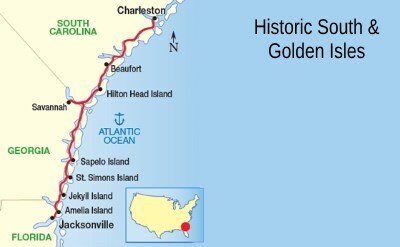 American Cruise Line 7-night Historic South and Golden Isles cruises to Charleston, SC. • 2019 departures: April 6, April 13, April 20, November 16, November 24, November 30, December 8, December 28. • 2020 departures: February 22, March 7, March 14, March 21, March 28, April 4, April 11, April 18, November 14, November 28, December 20.